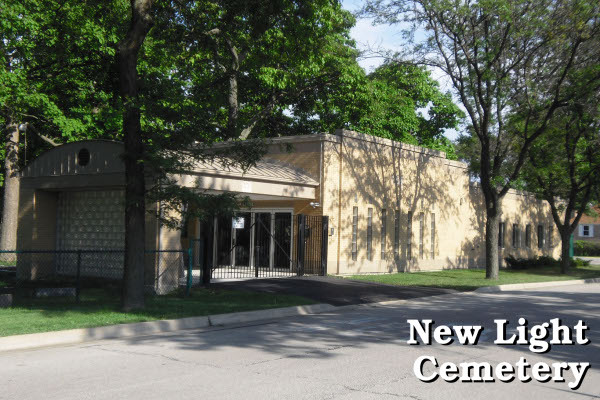 New Light Cemetery is a small, well-maintained Jewish cemetery in Lincolnwood, Illinois. It was founded in 1895, then extending over what is now Pratt Avenue. Today, it lies entirely north of Pratt Avenue, east of NE Prairie Road. New Light has recently undergone a major improvement, with the construction of the Mander Chapel building, dedicated in the summer of 2006. Al Gruen, President of New Light Cemetery, kindly assisted this author with historical information and an invitation to the dedication ceremony.